There is great satisfaction in engaging and compelling nonfiction picture books. Barb Rosentsock reminded me of this recently in her post about THE IRIDESCENCE OF BIRDS, by Patrica MacLachlan. I made a point to seek this book out and found it gorgeous. Both the writing and the delightful illustrations by Hadley Hooper. I am always surprised when someone can reel me in so completely with so few words and teach me so much. Another terrific nonfiction picture book just came out this week. 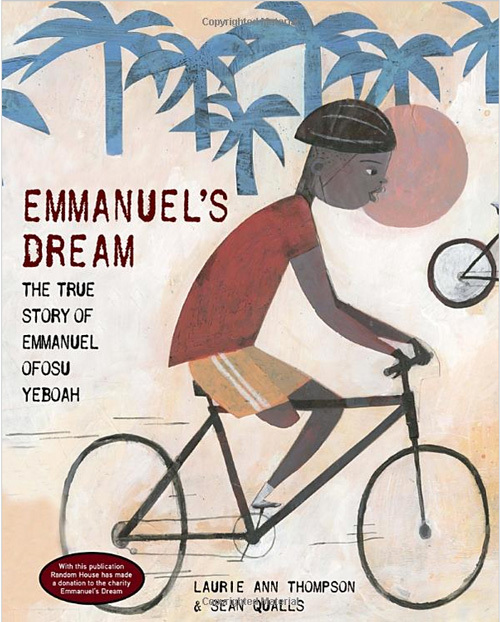 EMMANUEL’S DREAM, THE TRUE STORY OF EMMANUEL OFOSU YEBOAH, by Laurie Thompson and illustrated by Sean Qualls. Emmanuel’s story is inspiring to begin with, and Laurie knew it ten years ago when she first learned of it and began the process of turning it into a picture book. Briefly, it is the story of a boy born in a small village in Ghana, with strength and perseverance, but only one strong leg and who eventually becomes a voice for the disabled. In 32 pages Laurie takes us from Emmanuel’s birth, when his father walks out on the family to his determination to go to school and fit in with the other kids. His mother, Comfort, tells him, “he could have anything he wants but he would have to get it for himself.” We are taken through his youth where he eventually makes friends and even plays soccer on crutches. We learn how Emmanuel struggles to learn to ride a bike with only one leg, the lengths he goes to help his family, and the continued challenges he faces having just one strong leg in a country with disdain for the disabled. And finally we learn of his crowning achievement as a young man, riding his bicycle 400 miles across Ghana to spread a message of strength—disability does not mean inability. Sean Qualls illustrations are wonderful. They are executed in a warm, muted palette of reds, oranges, yellows and greens and that, even though I have never been, feels like west Africa. The loose composition, the characters, the patterns and textures, even the gentle way Emmanuel’s deformed leg is depicted all work so well together. Each of these spreads by themselves is wall-worthy art. As illustrations for this book they are perfection. I am fascinated by Emmanuel’s story as much as I am fascinated by Laurie’s telling of his story. She teaches us and entertains us so much in so few pages. For me writing non-fiction has always been hard, clinical. I’m sure it goes back to my schooling. Writing nonfiction = writing reports. Which made me anxious and vulnerable about getting all the facts right. Maybe I never wrote a report about something I enjoyed. Or maybe the anxiety about writing a report took all the joy out of the writing. Who knows. But you can tell when a writer of nonfiction enjoys their subject. It is obvious that Laurie Thompson put a lot of love and caring into this terrific book. Looking forward to reading this. I’m working on a non-fiction book that I hope potential readers someday will feel the writer loved her subject. That’s all I’d need! I agree–it’s a beautiful story, engagingly told in words and pictures. Thanks for the great post, Kevan! Wow, this looks like a great story and great book. Can’t wait to find it. And I love the illustration style and colors: I agree it seems to have a west African feeling. Great writeup on a beautiful story. I will look for this title! This sounds really compelling, and looks beautiful — I love the typeface on the cover. I love nonfiction PBs that share a personal triumph in spite of a disability. Sounds wonderful! And I’m a big fan of Sean Qualls as an illustrator. Great review, Kevan. I’m definitely looking this one up next week. What an inspiring, compelling story. As a writer, I find it comforting that Laurie began working, or at least thinking on it, ten years prior. What a labor of love! I’m so happy to see another book representing diversity in such a warm way. Thanks for sharing! Can’t wait to find this one. This is a really wonderful book! It’s a joy to see nonfiction picture books handled in such a warm and child-friendly way, without being pedantic and dull–a far cry from the biographies we had to muddle through when I was a kid. Congratulations to Laurie for writing such a spectacular story, and to Sean for bringing it to visual life with his wonderful illustrations. What an exquisite post. Thank you Kevin. Emmanuel’s Dream is on my TO READ list for sure. Non-Fiction certainly has turned a corner these past few years. Look at the awesome NF represented in the latest awards and honor books. With Common Core, these books are in high demand and our kids are reaping the benefits!